A distinct structure sits on top of a hill, overlooking Pailin and the surrounding countryside, decaying from years of neglect. 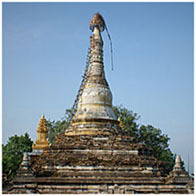 It is an old stupa, known as the Aung Sular Mani (Aung Chular Mani Kyar-daik) a monument built in late 19th century by the immigrants from Burma (now Myanmar) who once lived and prospered as traders in Pailin. Pailin, a province in the west of Cambodia near the border of Thailand was the final strong hold of the Khmer Rouge and home to many Burmese immigrants or as referred to by the locals; Kola people. Almost all of them have disappeared from the town since the demise of the Khmer Rouge in 1979, creating an air of mystery on the origins and history of the monument. 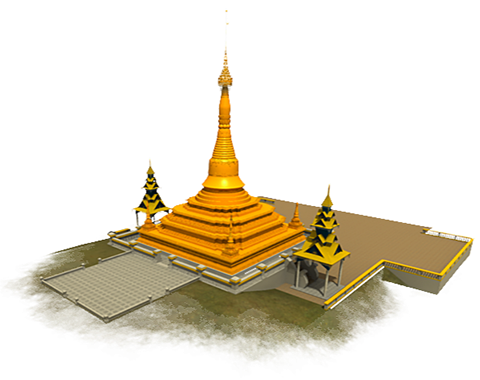 The stupa was built by those very immigrants and its style is remarkably similar to the many stupas in Myanmar. It consists of five towers – four smaller ones and the main tower – with the names of its donors written in Burmese script. According to the Burmese calendar, the smaller stupas were built in 1287 which is the year 1925 in universal calendar. It is believed that the main stupa was built even earlier since the type of cement for the main stupa is rather old and different from the smaller stupas. After a chance encounter of the stupa by SEANET’s Chairman, Mr. Pyone Maung Maung in 2010, a restoration agreement was signed with the Ministry of Culture, Kingdom of Cambodia which marked the beginning of an arduous restoration of the Aung Sular Mani. Mr. Pyone Maung Maung also has plans to establish a museum where images of the stupa both before and after the restoration will be exhibited. The museum will also include artefacts and materials that details the history of the Kola people and how their influence has continued to shape certain aspects of life in Pailin. Despite the fact these people vanished from the city, their names are carried throughout history in the songs and novels that reference them and many places in Pailin are also named after words in the Kola language. It is hoped that after the restoration is complete, the Aung Sular Mani will play an important role in attracting more tourists to Pailin province. Copyright © 2011 Southeastasianet Technologies MSC Sdn Bhd, All rights reserved.